En masse they have emerged from their coops and let out a loud, patriotic howl about reseizing the "title of titles" from the possession of the black man. Here they stand, a lovely mess of pugilist derelicts preening their frayed plumes in patriotic fervor, making great show of being latter day Casabiancas, St. Georges, and gentleman Joan of Arcs. Here Jack Johnson has been making extensive peregrinations over the world, wasting away for the want of a fight. All the while the surface of the sea of swat lay bland, placid and unrippled. Now the Galvestonian comes back with the prime prize, and the tombs resound with challenges from every pugilistic mummy since the deluge. The country reverberates with the brave cry of "the title must come back to the Caucasian." Truly a fine excuse for these St. Georges of the prize ring to work upon the public. They are ready to face the dusky dragon in his den and blushingly bring back the title. Behold the heroes: "St. Lemo" Jack O'Brien, Marvin Hart, Mike Shreck, "Tawm" Sharkey, Corbett: that rare old Dodo, Bob Fitzsimmons, and oh, spare us, John "Twin" Sullivan. They clang their tin armor and puff their age worn breasts and acclaim themselves Davids ready to crack the dome of somber hued heavyweight Goliath to bring back our fair title to its home. Now that we have heard from those whom we long thought defunct, let us give ear to Kid Camembert, Battling Brie, Terrible Roquefort, Spike Limburger or some other good heavyweight fromage. The title will abide awhile with Johnson, unless the one man, James Jeffries, decides to climb over the ropes. In the meanwhile call in Doctor Osler and let him get busy in the heavyweight division. 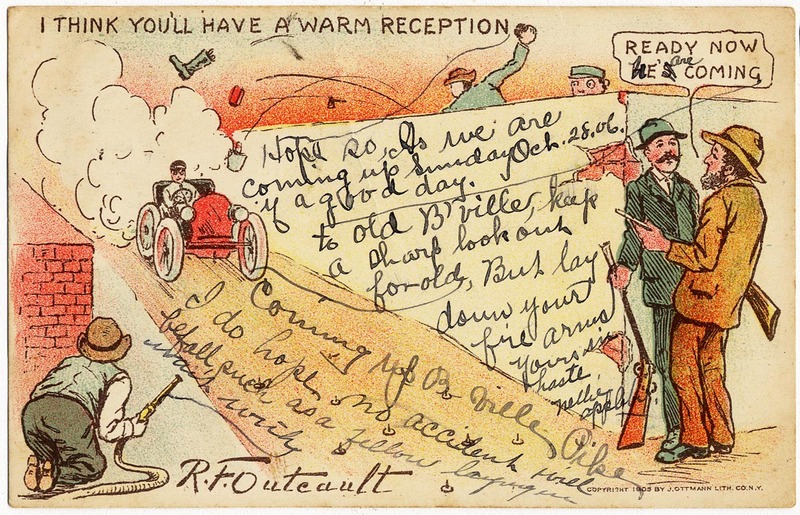 Another 1905 Ottmann postcard by R.F. Outcault, this one showing the disdain of the rustics for those newfangled auty-mobiles. Thanks Nellie Appleby for your long and convoluted message. We'll roll out the red carpet for ye. ( Ready now we are coming -> ) ( ? ) a good day. DeVoss Woodward Driscoll was born in Nosha Falls, Kansas, on October 7, 1873, according to a family tree at Ancestry.com. His parents were Dr. John William Driscoll (1829–1876) and Glorianna Ellen Beeman (1839–1922). The 1880 U.S. Federal Census recorded Driscoll as the youngest of five brothers whose mother was the head of the household. They resided in Sidney, Ohio. According to the family tree, Driscoll married Anne Maude Mills on June 25, 1895. Their daughter, Helen, was born in Illinois. The 1896 Dayton, Ohio, city directory listed Driscoll as an artist with the Gem City Engraving Company. He boarded at 319 East 2nd. Two years later, the directory said Driscoll was a designer who resided at 438 West 3rd. In the 1899 directory, Driscoll was a newspaper artist with the Dayton Daily News. Artists in Ohio, 1787–1900: A Biographical Dictionary (2000) said Driscoll worked on the Dayton Evening Press in 1895 and 1896. The 1900 census said the Driscolls were Detroit, Michigan residents at 137 Sixth. Driscoll’s occupation was cartoonist. Driscoll illustrated the book, The Dicts and Sayings of the Philosophers (1901). Driscoll was granted a divorce on June 24, 1902. Later that year, Driscoll married Anna Babcock Yager. Their son, Alden, was born the following year in Michigan. At some point, Driscoll moved. 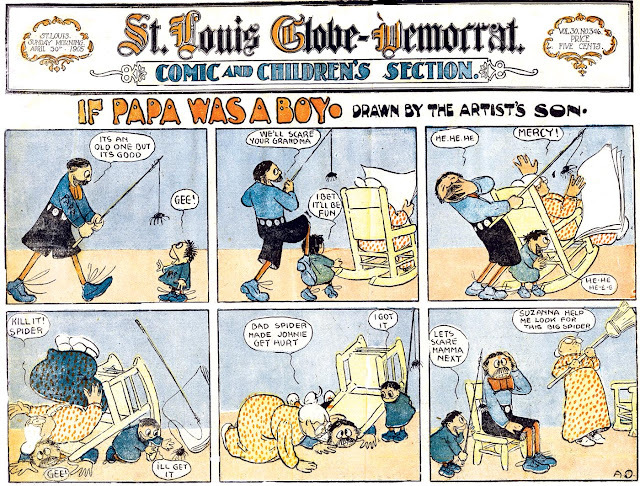 In St. Louis, Missouri, Driscoll produced many comic strips for the St. Louis Globe-Democrat newspaper. 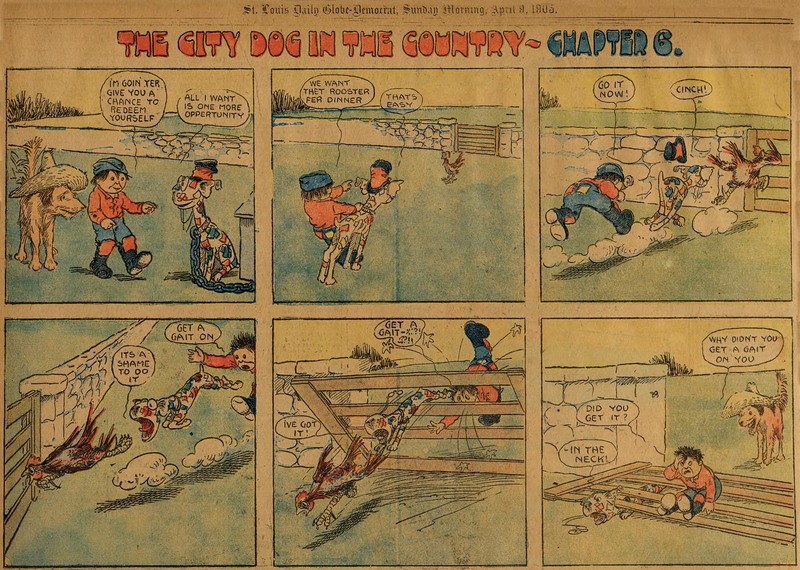 American Newspaper Comics (2012) said Driscoll produced, from late 1903 to mid-1905, the following strips: Animal Antics; Baby; Cholly; The Chubbies; The City Dog in the Country; Der Colonel und Der Kidders; Funny Feathers of the Fowl Family; Hot-Foot Willie; Hungry Hat and the Old Stray Mule; If Papa Was a Boy; Iftown; Jack of All Jobs; Jimmie at the Fair; Mother Goose in a New Dress; Mrs. Bones’ Boarding House; Mud Pie Peggy and Master Misfortune; Nebuchadnezzar and Rastus Johnsing; Papa and Winning Willie; and Rastus. One of Driscoll’s editorial cartoons was reprinted in The Literary Digest, December 10, 1904. The 1905 Dayton city directory had these listings for Driscoll, his brother George and their company. One of their projects was supplying the caricatures for the book, Business Men of Dayton 1905–1906. Driscoll’s whereabouts were reported in the Rockford Republic (Illinois), May 25, 1906. Mr. D.W. Driscoll, the Republic Cartoonist who will commence a series of caricatures of prominent Rockford citizens in this paper within a short time, with his associate W.B. De Haas entertained a small number at a river party yesterday. They engaged the Steamer May Lee for the afternoon and had a very pleasant sojourn up the river where they were greatly surprised at the scenic beauty. Messrs. Driscoll and De Haas have been working several days on the interesting symposium of cartoons of leading lights in the various professions and commercial enterprises which will appear during the next several weeks in the Republic and the outing yesterday furnished them recreation and rest from their labors. The 1910 census recorded Driscoll and his family in Racine, Wisconsin, at 246 Main Street. Driscoll was the business manager of the Times Publishing Company. Some time after the census, Driscoll moved to Dayton, Ohio. Dayton city directories for 1911 and 1912 listed Driscoll as a cartoonist at the National Cash Register Company (NCR). In 1913, Driscoll was in the NCR advertising department. The next year, Driscoll was the advertising manager. School Board Journal, February 1914, mentioned Driscoll in its “Moving Pictures” article. Driscoll, a cartoonist on an Ohio newspaper, has depicted in contrast what good and bad moving pictures may suggest. One scene in the picture shows a robber snatching a man’s purse. The boy who has been an interested spectator, in the picture house, retires and later is seen setting out, pistol in one hand, a bloodcurdling story book in the other to perhaps reenact in actual life some awful tragedy. In contrast, another boy watches an educational film in a proper show, retiring to a library, where surrounded by histories, guide-books and perhaps a tutor, he is led on in his enthusiasm, to learn more about some country or people or industrial process, perchance, some moving drama of the ages, to reach up to still greater conquests of the constructively educated mind. 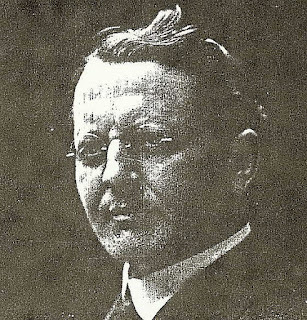 1914 ended with the death of Driscoll’s son, Alden, on December 27. Motography, May 1, 1915, reported Driscoll’s new business venture. The Pyramid Film Company, 14 East Second street, was recently incorporated at Columbus for $12,000. Officers of the enterprise are: D. W. Driscoll, formerly advertising manager of the National Cash Register Company, president; G. C. Driscoll, vice president, secretary and treasurer, and A. N. Nelson of Detroit, second vice president. The same address was in the 1915 Dayton city directory which listed Driscoll rooming at 133 North Salem Avenue. Driscoll lost has wife who passed away May 22, 1915. In Detroit, Michigan, Driscoll married Mildred L Ferneding on June 20, 1916, as recorded in the Michigan marriage records at Ancestry.com. The couple resided in Dayton at 1140 East Wyoming. Driscoll passed away November 22, 1916, in Dayton. His death was reported in a single paragraph in many newspapers and periodicals. The family tree posted a lengthy obituary and photograph of Driscoll from an unidentified publication. Presumably they are from a Dayton newspaper. De Voss Woodward Driscoll, aged 43, former well known cartoonist and newspaper man and head of the advertising department of the N.C.R., died at the Miami Valley Hospital at 4:30 o’clock Wednesday morning. He had been ill four weeks. Mr. Drsicoll was an exceptionally talented and versatile man. His gifts and his attainments had given him the opportunity to hold several responsible positions. During his younger days he was employed on several large newspapers, at one time holding the position of cartoonist on the Daily News. He originated the mule “Maud” cartoons. He was also a feature writer as well as an author of humorous verse. While he gave up his work on the newspapers, he continued his connection with the publicity business. He became an expert advertising writer, and was finally selected for the position of manager of the advertising department of the N.C.R. He held this position four years, or up to the time of his resignation in October, 1914. Mr. Drsicoll left the N.C.R. to engage in special advertising work, and was head of a publicity company that covered the United States and Canada. He was manager of the Pyramid Film company at the time of his death. Forty-three years ago he was born in Nosha Falls, Kan. His parents removed to Sidney where he spent his boyhood. For many years he has lived in Dayton. Last June he was married to Miss Mildred L. Ferneding, who survives him, together with his mother, Mrs. Glorianna Dricsoll; and four brothers, Dr. Park and Charles D. Driscoll of Detroit, Frank T. Driscoll of San Francisco, and G.C. Driscoll of Dayton. He was a member of the Mystic lodge of Masons and of the Elks lodge, No. 58. 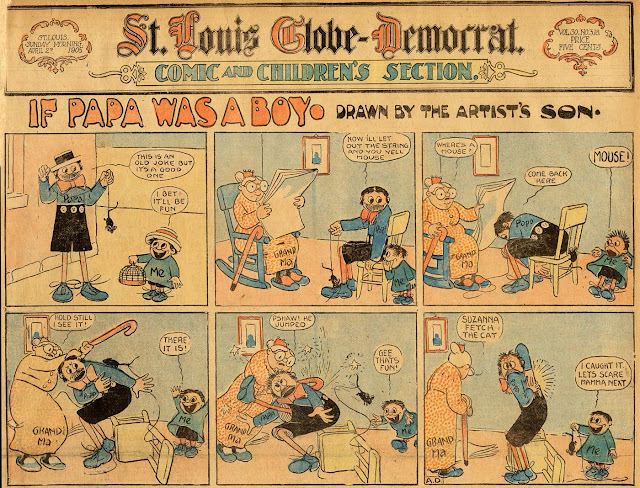 Yesterday we featured a DeVoss Driscoll strip, If Papa Was a Boy, in which he aped the cartooning ability of a child. Today we see Driscoll's real art style, which although perhaps not the stuff of a McCay or a Herriman, has an energetic and boisterous charm. 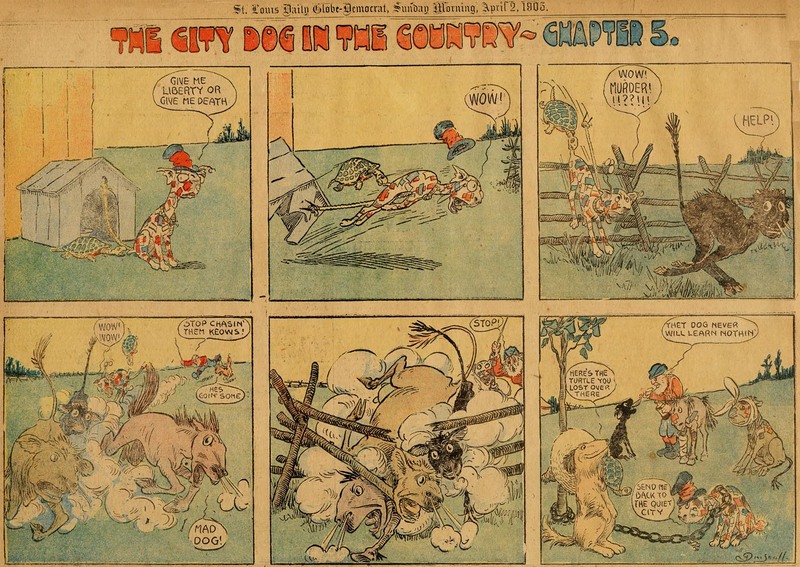 The City Dog in the Country followed the slapstick misadventures of a dog who is out of his element on a farm. In case you're wondering about the very odd coloring on the dog, the blue and red bits are supposed to represent bandages, which he has earned from previous episodes of the strip. An odd feature of this strip is that it is offered in 'chapters', as if there were some ongoing narrative that must be followed by the reader. This isn't really the case, except that in chapter one the dog arrives on the farm, and in the final chapter, he returns to the city. 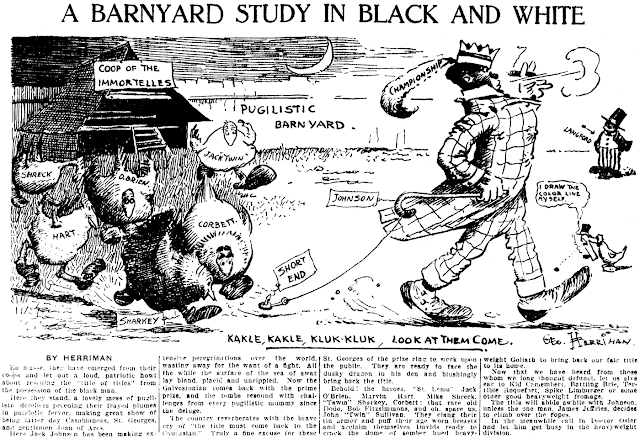 The City Dog in the Country ran in the St. Louis Globe-Democrat's home-cooked Sunday comic section from March 5 to June 4 1905.
you posted this one minute after my comment on the previous. If I was editing a comic (as I have done in the past on occasion) and this guy came in the door, I'd beg him to use yesterday's style and give him the spot. I even thought the repetitious gag was okay. Some of the better Driscoll art I've seen! Didn't really mind the strange coloring on the dog. Good post. DeVoss Driscoll, who was a mainstay of the locally-produced Sunday comic section of the St. Louis Globe-Democrat in 1903-05, was a decent artist, but not much of a gag writer. Therefore it might not have been his most brilliant idea for a series that he would draw it as if a child was doing the art. In If Papa Was a Boy readers got the worst of both worlds -- bad art and bad writing. On the other hand, since Driscoll was producing a heck of a lot of material for the comic section, maybe the idea was borne of necessity -- he simply did not have time to draw all of his material. Solution -- draw badly, but with an ironclad excuse. Driscoll went so far as to sign the strip "A.D." -- presumably he had a son whose name began with letter 'A' (a presumption that I will leave Alex Jay to explore if he desires). If Papa Was a Boy ran in the Globe-Democrat from March 26 to June 4 1905, near the end of Driscoll's ordeal -- the newspaper would soon switch over to syndicated content. Since Mr. Driscoll really was a decent artist, we'll feature him tomorrow drawing in his native style. Fair's fair! Lewis Crumley Gregg was born in Atlanta, Georgia, on October 9, 1880. Gregg’s full name and birth date were recorded on his World War I draft card. His birthplace was named on a 1930 passenger list. Gregg’s parents were William Alanson Gregg (1848–1895) and Elizabeth Luckie Gregg (1859–1952). The 1880 U.S. Federal Census was enumerated four months before Gregg’s birth. Gregg’s parents and paternal grandmother resided in Atlanta on Pulliam Street. His father was a hardware merchant. Specific information about Gregg’s education has not been found. The Atlanta Constitution, July 30, 1916, said Gregg studied at the Art Students’ League in New York. Gregg’s widowed mother was the head of the household in the 1900 census. Art student Gregg was the oldest of six siblings. Everyone resided in Atlanta at 176 Rawson. Around 1901, Gregg joined the Constitution newspaper staff. 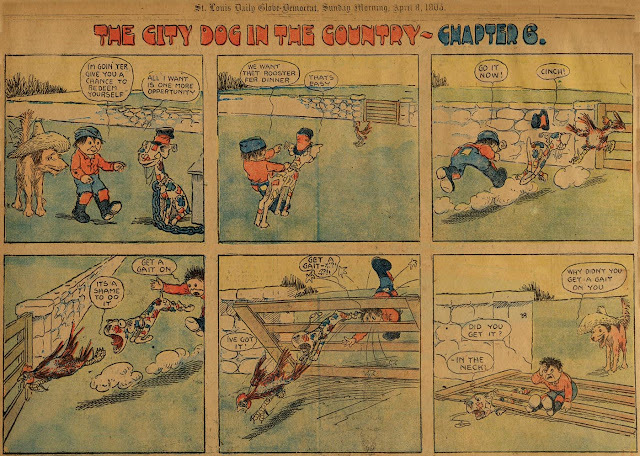 Gregg’s work was collected in Cartoons by Gregg (1904). City directories from 1903, 1905, 1907 and 1909 listed Gregg as a Constitution artist who resided at 176 Capitol Avenue which was the address in the 1910 census. Gregg, his mother and five siblings lived there. The 1915 city directory had the same address for Gregg. 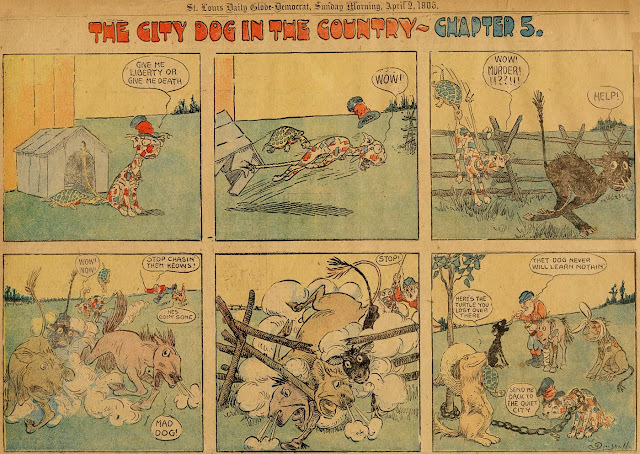 American Newspaper Comics (2012) said Gregg produced Gilly the Gopher (a gopher tortoise), for the Constitution, which ran it from April 9, 1912 to January 22, 1913, plus a one-week return June 28-July 2 to advertise a reprint book published by the Cole Book Company. Listings in the American Art Annual, Volume 14 (1917) included Gregg’s art school. Lewis C. Gregg School of Drawing, Constitution Building. Lewis C. Gregg, director. Established 1915. Antique and sketch from costume models, cartoon and newspaper illustration. Day and evening classes. Tuition, $10 a month for four days a week; $5 a month for two days a week. Enrollment, 45. 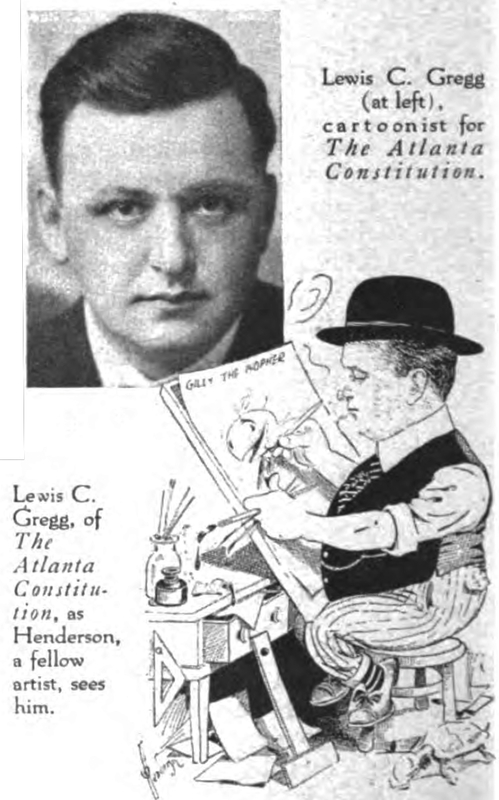 Lewis Crumley Gregg, cartoonist for the Atlanta (Ga.) Constitution, was married to Miss Mamie Ansley in Atlanta on the evening of October 11. Mr. Gregg, for fifteen years connected with the art department of the Constitution, is a graduate from the Art Students' League of New York. He is better known to the newspaper world and to the public as the originator 'of the famous “Gopher,” the little animal which appears in all of his cartoons. Miss Ansley, now Mrs. Gregg, is one of the leaders in Atlanta’s social set. She is the daughter of Edward P. Ansley, a prominent real-estate man of that city. Immediately after the ceremony Mr. and Mrs. Gregg left for New York, where they spent their honeymoon. Moving Picture World, December 1, 1917, said Universal Current Events, filmed 39 cartoonists, including Gregg. On September 12, 1918, Gregg signed his World War I draft card. The cartoonist lived in Atlanta at 220 Ponce De Leon Avenue. The description said Gregg was five feet, eleven-and-three-quarter inches and 210 pounds with gray eyes and light brown hair. Gregg’s home in Atlanta was at 3 Durant Place in the 1920 census. A 1925 city directory had Gregg’s address as 30 Polo Drive. The Macon Telegraph (Georgia), July 11, 1929, noted Gregg’s plan to study abroad: “Lewis C. Gregg, for 26 years a cartoonist with the Atlanta Constitution, sails tomorrow from Jacksonville for a year of study in Paris and London. He will be accompanied by Mrs. Gregg.” Passenger lists at Ancestry.com said Gregg departed July 23, 1929 and returned August 21, 1930. City directories for 1938 and 1956 and the 1940 census said Gregg was a portrait painter who continued to live in Atlanta at 30 Polo Drive. Gregg passed away March 19, 1957, in Atlanta. He laid to rest at Oakland Cemetery.